Construction of the walls, built-in fireplace and roof for the Family Room Addition The family room addition and pantry is staring to take shape, the walls are up and the windows and doors are framed in. 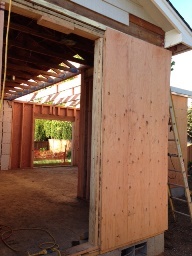 The existing house was built with Insulated Concrete Forms (ICF) and we have matched the thickness of the new walls in the addition for a seamless transition once the addition is completed. 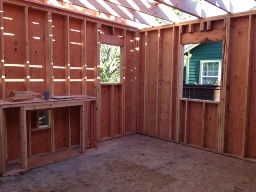 Windows and the new built-in fireplace are framed in. 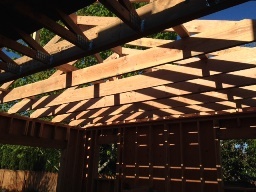 Ceiling and roof joist are in place.